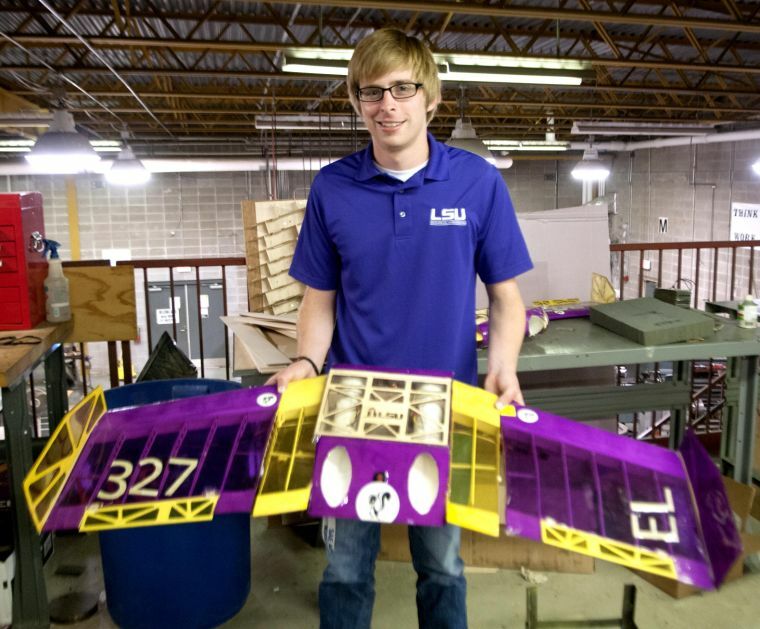 LSU engineering senior Sean King holds his team's capstone project. The design is the 2014 SAE Aero Design West Micro Class Aircraft. 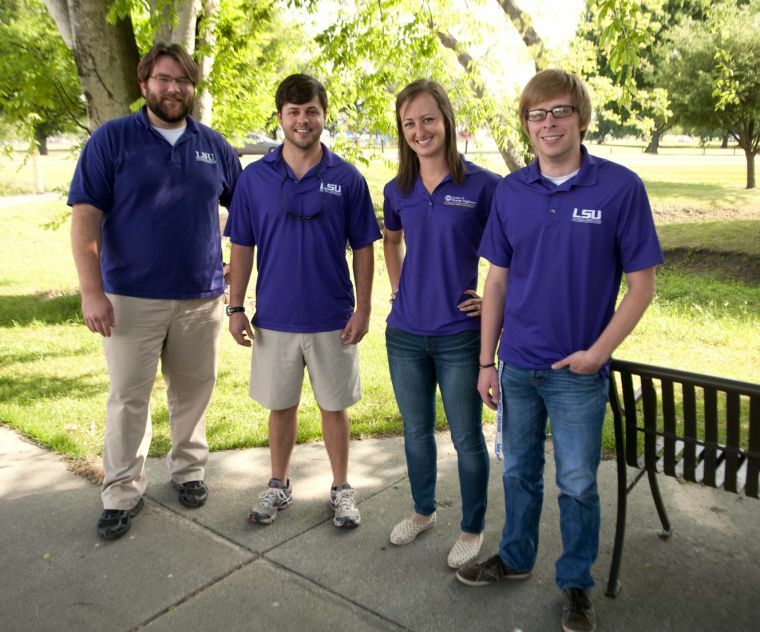 LSU engineering seniors (R to L) Sean King, Kaitlin Simmons, Carl Polito, and Jon Lawhun completed senior capstone projects with the help of their teams. While her friends from other majors hit the books, mechanical engineering senior Kaitlin Simmons knocked down doors with a SWAT team in preparation for her finals. Such is life for fourth- and fifth-year seniors enrolled in the Capstone Design Program. The Capstone Design Program is a two-course sequence that begins with an idea for a real-world application of learned engineering skills. It culminates in the construction of a usable industrial product with practical applications. “All mechanical engineers have to do this, and if you don’t, you fail and have to try all over again next year,” Simmons said. In the first class, ME 4243, students are assigned to teams that work on real projects proposed by industry, nonprofit or University sources. Students then design a product that meets the specifications of the group that proposed the projects, who effectively serve as their employers, said mechanical engineering senior Jonathan Lawhun. In the second class, ME 4202, students build the products after their designs have been approved by select faculty. Project funding typically comes from the companies who propose the projects, but it’s the students’ job to procure the funds and allocate their budget, which typically runs between $500 and $3,000. “Staying within budget is a real and difficult thing you have to do in industry, and you learn how to do that in this class,” Lawhun said. Lawhun said managing a budget and working with a team were both the biggest challenges and most rewarding parts of his capstone experience. Together with teammates Colin Blood and Yugen Ijardar, Lawhun and his peers constructed a machine that accelerates the corrosion of various materials for the University’s materials lab. Underclassmen will use the machine to perform experiments as a part of their grade for materials classes. It was difficult for the team to stay under budget, but with the advice of various professors, they built the machine even with these monetary constraints. Simmons, who built the pneumatic door breacher for her father’s company, took a different approach to her budget. Her entire team, consisting of James Arceneaux, Jonathan Albritton and Austin Lobell, each contributed more than $500 out of their own pockets to the project. “We all have jobs, so it wasn’t so bad,” Simmons said. Still, the task was a difficult one, given that the project requires between 40 and 100 hours of work per week, said mechanical engineering senior Sean King. “My team built a plane for the SAE Aero Design team that had to carry a lot of weight, and we spent hours just watching our plane crash, and retesting and redesigning it,” King said. For mechanical engineers, though, failure is not an option, and to demonstrate this, any team that fails to produce a working product is not permitted to graduate. In addition to building the product, students must also produce an accompanying design notebook that details every part of the process. The notebook is checked frequently, and any omissions result in point deductions. Students use these notes to present their projects to a board of engineering professors at the end of the semester. If their work isn’t considered adequate, they don’t graduate. On top of these problems, which King considered “pretty standard,” some teams encountered even greater roadblocks on their capstone journeys. Garen Armbruster, the leader of his team, said he didn’t receive his budget until March 26. Armbruster’s team designed a mobile marksman system for quadriplegics but couldn’t start building it until they received their money. “It was really tough, but we pulled through,” Armbruster said. All these challenges might have resulted in a giant collective headache for the seniors, but in the end, they said, it was all worth it. “Building this plane made me realize I wanted to go into a particular discipline of aerospace engineering in grad school, so it was worth doing the project just to learn that,” King said. Last week, Armbruster and his team watched a group of quadriplegics try their mobile marksman system, albeit without the guns attached. “Watching their faces light up and knowing we’d made their lives better was just an amazing experience,” Armbruster said. Lawhun cited the capstone program as integrally important to the job interview process. “I could refer back to the project for every question they asked. Having this real experience is important in engineering,” Lawhun said. Simmons was just glad her product worked. “After knocking down doors cemented in our front lawn all semester, there was no better feeling than watching the SWAT team use it for something real,” Simmons said.